Is Valero Energy Corporation (VLO) A Good Stock To Buy? Insider Monkey has processed numerous 13F filings of hedge funds and famous investors to create an extensive database of hedge fund holdings. The 13F filings show the hedge funds’ and investors’ positions as of the end of the fourth quarter. You can find write-ups about an individual hedge fund’s trades on numerous financial news websites. However, in this article we will take a look at their collective moves and analyze what the smart money thinks of Valero Energy Corporation (NYSE:VLO) based on that data. Valero Energy Corporation (NYSE:VLO) was in 32 hedge funds’ portfolios at the end of the fourth quarter of 2018. VLO has experienced a decrease in support from the world’s most elite money managers in recent months. 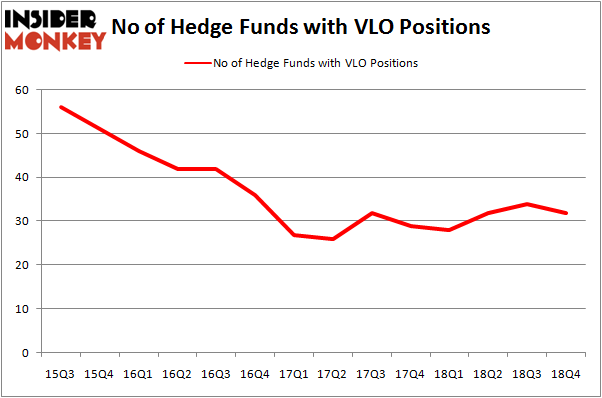 There were 34 hedge funds in our database with VLO positions at the end of the previous quarter. Our calculations also showed that VLO isn’t among the 30 most popular stocks among hedge funds. To most shareholders, hedge funds are viewed as slow, outdated financial tools of the past. While there are greater than 8000 funds with their doors open today, Our researchers look at the masters of this group, around 750 funds. 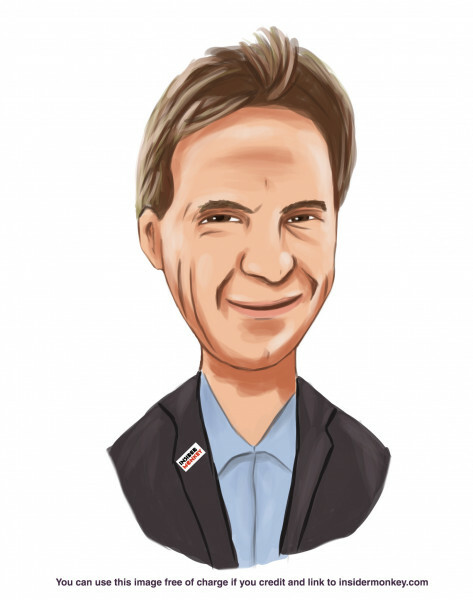 These investment experts oversee bulk of the hedge fund industry’s total capital, and by watching their first-class equity investments, Insider Monkey has deciphered a few investment strategies that have historically outperformed Mr. Market. Insider Monkey’s flagship hedge fund strategy defeated the S&P 500 index by nearly 5 percentage points per annum since its inception in May 2014 through early November 2018. We were able to generate large returns even by identifying short candidates. Our portfolio of short stocks lost 27.5% since February 2017 (through March 12th) even though the market was up nearly 25% during the same period. We just shared a list of 6 short targets in our latest quarterly update and they are already down an average of 6% in less than a month. We’re going to take a look at the recent hedge fund action surrounding Valero Energy Corporation (NYSE:VLO). What have hedge funds been doing with Valero Energy Corporation (NYSE:VLO)? Heading into the first quarter of 2019, a total of 32 of the hedge funds tracked by Insider Monkey were bullish on this stock, a change of -6% from the second quarter of 2018. Below, you can check out the change in hedge fund sentiment towards VLO over the last 14 quarters. With hedgies’ capital changing hands, there exists a select group of notable hedge fund managers who were increasing their holdings considerably (or already accumulated large positions). Among these funds, AQR Capital Management held the most valuable stake in Valero Energy Corporation (NYSE:VLO), which was worth $609.2 million at the end of the third quarter. On the second spot was Renaissance Technologies which amassed $136.5 million worth of shares. Moreover, Two Sigma Advisors, Point72 Asset Management, and Arrowstreet Capital were also bullish on Valero Energy Corporation (NYSE:VLO), allocating a large percentage of their portfolios to this stock. Because Valero Energy Corporation (NYSE:VLO) has faced declining sentiment from the smart money, it’s safe to say that there exists a select few hedgies who sold off their positions entirely last quarter. It’s worth mentioning that Rob Citrone’s Discovery Capital Management sold off the biggest investment of the “upper crust” of funds monitored by Insider Monkey, worth an estimated $18 million in call options. Andrew Feldstein and Stephen Siderow’s fund, Blue Mountain Capital, also dumped its call options, about $16.5 million worth. These bearish behaviors are important to note, as aggregate hedge fund interest fell by 2 funds last quarter. Let’s also examine hedge fund activity in other stocks similar to Valero Energy Corporation (NYSE:VLO). These stocks are HP Inc. (NYSE:HPQ), Analog Devices, Inc. (NASDAQ:ADI), The Travelers Companies Inc (NYSE:TRV), and Applied Materials, Inc. (NASDAQ:AMAT). This group of stocks’ market valuations are similar to VLO’s market valuation. As you can see these stocks had an average of 33 hedge funds with bullish positions and the average amount invested in these stocks was $1580 million. That figure was $1348 million in VLO’s case. HP Inc. (NYSE:HPQ) is the most popular stock in this table. On the other hand Analog Devices, Inc. (NASDAQ:ADI) is the least popular one with only 23 bullish hedge fund positions. Valero Energy Corporation (NYSE:VLO) is not the least popular stock in this group but hedge fund interest is still below average. Our calculations showed that top 15 most popular stocks among hedge funds returned 19.7% through March 15th and outperformed the S&P 500 ETF (SPY) by 6.6 percentage points. Hedge funds were also right about betting on VLO, though not to the same extent, as the stock returned 14.7% and outperformed the market as well. Were Hedge Funds Right About Dumping FedEx Corporation (FDX)? Were Hedge Funds Right About Selling Northrop Grumman Corporation (NOC)? Is Illinois Tool Works Inc. (ITW) A Good Stock To Buy? Is Vertex Pharmaceuticals Incorporated (VRTX) A Good Stock To Buy? Were Hedge Funds Right About Ecolab Inc. (ECL)? Were Hedge Funds Right About Getting Into Bank of Montreal (BMO)?